WPG office building in Shanghai, China. Column wrapping, reception desk and main lobby impact space with Corian® Solid Surface (Glacier White colour). WPG is China’s leading smart water solution provider. The company’s mission is to build a green sustainable future with water. As a pioneer in water solution industry, WPG aims to bring internet + industrial concept to modern water treatment (from smart water supply system to secondary water management platform) providing last mile solution for urban city. WPG’s latest office building is designed with “water” as the key element. The theme focuses in creating a water current impression within impact space using curves and lighting. The spirit of water is translated into modern interior design through the flexibility of Corian® Solid Surface. Lobby columns are warped in Corian® Solid Surface in the Glacier White colour; seamless join from floor to ceiling creating a visual impact similar to water fountain spraying to sky. To form a unified lobby space, Corian® Solid Surface is also used in reception table and interior cladding; different areas are integrated together using lighting and seamless join – creating a space with emphasis on the “flow” of water current. WPG office building in Shanghai, China. Lobby column using Corian® Solid Surface (Glacier White colour) (Glacier White colour); photo Corian® Design, all rights reserved. WPG office building in Shanghai, China. Public space and office area make uses of Corian® Solid Surface (Glacier White colour); photo Corian® Design, all rights reserved. 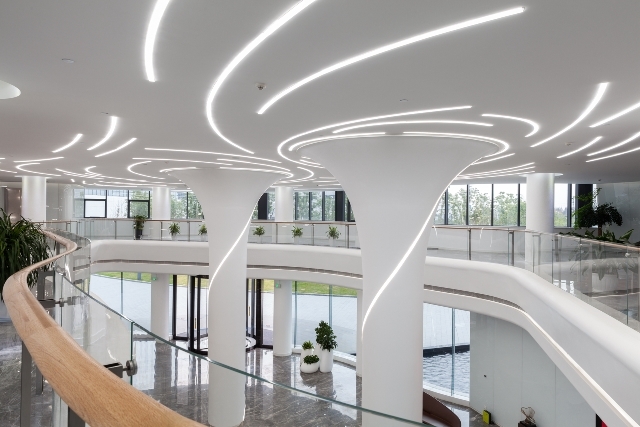 The interior of public space and office area make uses of massive amount of Corian® Solid Surface to create a flowing current impression. 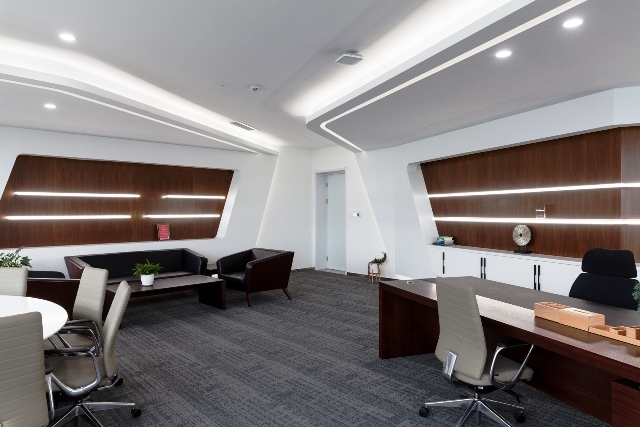 Reception desk, office furniture, interior cladding and washroom are all made with Corian® Solid Surface to provide consistent design and emphasize on “water” culture of the company, creating an energetic environment for work. WPG as the industry leader in water solution provides quality, green and economical product and services to the public. The company also promotes green building and makes themselves a role model by using green material in their new office building. Corian® Solid Surface enabled designers to translate the corporate culture and theme of “water” into contemporary design making a natural sustainable office space. WPG office building in Shanghai, China. 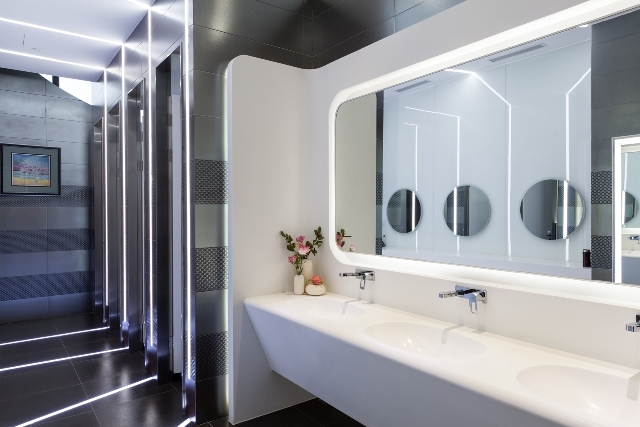 Seamless joint interior cladding and washroom countertop with Corian® Solid Surface (Glacier White colour); photo Corian® Design, all rights reserved.